The Oregon State Police lost two troopers on the same day in 1997. Sergeant James D. Rector and Trooper Scott A. Lyons were in a patrol vehicle near Crescent, Oregon about 43 miles south of Bend, Oregon on Tuesday, September 2, 1997. They had just completed a traffic stop and were called to assist another OSP trooper with a traffic accident. Upon arrival at the scene of the accident the OSP vehicle with Sergeant Rector and Trooper Lyons turned on their emergency lights and attempted a U-turn on the highway. A large truck was following the OSP vehicle and struck the OSP vehicle killing both occupants. Scott Lyons was the son of William R, and Barbara A. Lyons. Scott's father was also a member of the Oregon State Police. 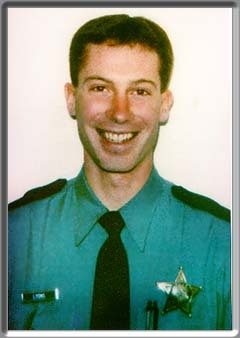 Scott Lyons became a member of the Oregon State Police On October 1, 1995 and had been an OSP Cadet for several years prior to becoming a full-time trooper. He had been assigned to the Gilchrist office for all of his service. Scott was born in Corvallis on August 26, 1974. He was raised in Bend and graduated from Bend High School and attended Western Oregon University and then the Oregon State Police Academy graduating in February 1996. Trooper Lyons was single. He was survived by his parents and sister. The funeral for the two officers was held in Bend and attended by more than 2,000 mourners. They were both buried in the Pilot Butte Cemetery in Bend.